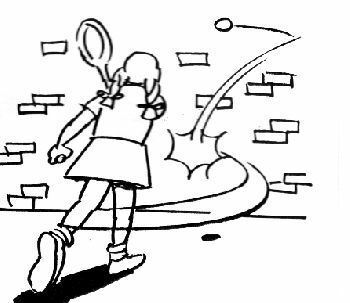 It is a game played between two people hitting the ball against a wall. It teaches spatial and body awareness, rebounding skills, and motor skills. The skills progress through the use of different balls. As the game gets more difficult, the ball will bounce further back into the court and require a little more racket skill and fitness. Children and parents will find it easy and enjoyable to play as a family and keep coming back for more. The aim of the game to simply hit the ball one more time than your opponent. Mini Swot can be played against a brick wall in the garage, school covered-way, or squash court. Stand anywhere to serve onto the wall. Bounce the ball to serve or project the ball off the racket. Serve to go about 2m high. 2 Serves each from alternate sides. If played at a squash court, behind the "short line" is out. Mod Swot is played using three walls. A squash court is an ideal venue. The ball used will need to bounce further back in the court, and bounce at least past the "short line". Stand behind the "short line" to serve. One foot in the Service Box to serve. Serve above the "cut line". Serve to land in the opposite half court. Bounce the ball to serve or serve out of the hand. Balls must be hit on the first bounce or volleyed. Swot is a lead up game to squash. The ball is bigger, and the racket not quite so long, making it easier to hit. 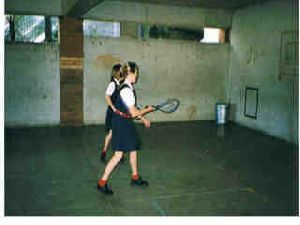 The game is best played on a squash court, where all the walls can be used. 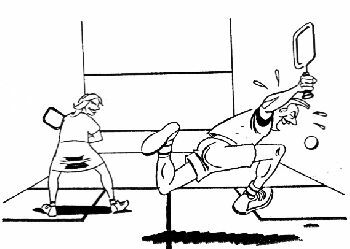 Since squash is fast, has a small ball, that travels very quickly, it may be necessary to build up the skills to enjoy playing squash. 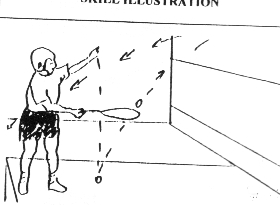 The Serve to hit the front wall and land above the "cutline". The Serve to land in the opposite Half Court. The ball must be hit on the first bounce or volleyed. First to 10 points wns. 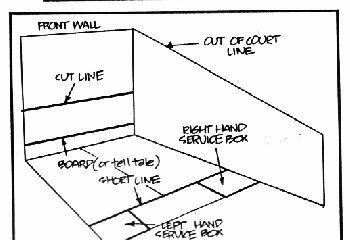 Since squash is a game that involves judging the ball rebounding off a wall it is imperative to get the "feel" of the rebound. Once having gained some confidence with the rebounding by bouncing the ball, then progress to volley rebounding drills. Hit/kick the ball away from your opponent. Hit/kick the ball into defined areas. Make your opponent run/keep on the move.